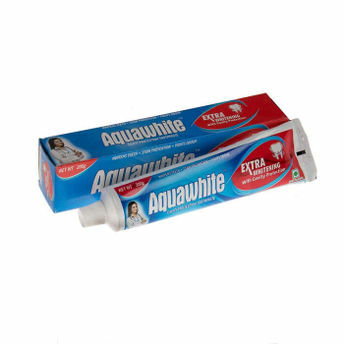 Aquawhite Cavity Protection Toothpaste is a dentist's most trusted choice for strong teeth and healthy gums. It has a special ingredient that provides extra whitening to your teeth and prevents teeth from getting stained. This toothpaste also fights odour to provide a feeling of freshness all day long. With its unique formula it ensures it takes care of the complete oral health of your family to provide them with a healthy and bright smile.